Home / Health / Healthy Eating / Which of the seven types of sugar is healthier? Find out! Which of the seven types of sugar is healthier? Find out! Last week on the radio, the announcer asked me if there was a 'good' sugar – one that would satisfy her sweet tooth but that was 'healthier' than regular white sugar. She figured if there were 'good' carbs and 'bad' carbs there must be some sugars that would get the nod of approval from nutritionists. So I thought it might be helpful to list the many different types of sugar and whether they're any healthier for you or not (spoiler: there's not much between them). 1. White granulated sugar is one of the world's purest foods. It's 99.9 percent sucrose, refined from the natural sugars that occur in the sugar cane but with all 'impurities' such as mineral ash and polyphenols completely removed. 2. Caster sugar has the same composition as granulated sugar, but the crystals are smaller so it dissolves quickly. It's best for baking, especially light sponges and meringues. 3. Icing sugar is white sugar ground to a fine powder so it dissolves quickly and makes a smooth icing. All three sugars have the same moderate Glycemic Index or GI of 65, which is much lower than pure glucose at 100. 4. Raw sugar and coffee sugar crystals are made from cane juice and are golden in color. In nutrition, they are virtually identical to white sugar - at 99 percent sucrose, they have a few minerals but not enough to give a great health advantage over white sugar. 5. Brown sugar contains 95 percent sucrose and 5 percent molasses, which adds a lovely toffee flavor and moistness but no great nutritional benefits over white sugar. The same applies to muscovado, demerara, rapadura and black sugars which are often preferred for baking. There's a little potassium, calcium, magnesium, and other minerals but they're not present in great quantities. Well1, not enough to make me sit up and take notice when I'm only consuming a teaspoon here and there. 6. Fructose powder contains the same kilojoules as sugar but, being slightly sweeter, can be used in smaller quantities to achieve the same degree of sweetness. 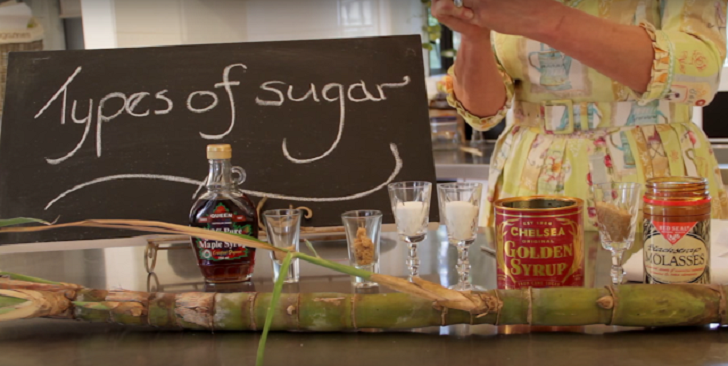 Now marketed as a 'natural cane sugar-free' sugar replacement, it has a low GI of anywhere from 15 to 19 which used to be its unique selling proposition. Fructose is metabolized differently to sugar and glucose and doesn't trigger the hormones that regulate appetite and food intake – which some research suggests means that it's much more likely to be converted into body fat. Note too that it has other drawbacks, such as causing abdominal discomfort. 7. Glucose powder is a white crystalline powder with a GI at a maximum of 100. It is the standard by which other carbs are ranked. At 100, this means that glucose is rapidly absorbed into the bloodstream and stimulates a fast insulin response. Glucose powder is not as sweet as regular white sugar so is fed to invalids as they can take in more food without being put off by the excessive sweetness. Athletes often notice glucose (under the term dextrose so you don't associate it with glucose or sugar!) marketed to them to use when they need instant energy. Like glucose jelly beans, it will quickly raise blood glucose levels and replenish blood glucose. Glucose is the simplest form of sugars and is the sugar in the blood, your body's primary source of energy. Despite their different colors and flavors, the nutritional value of these sugars is very similar. Sugar is sugar, whether white, brown or raw. All sugars are pretty much of a muchness. One teaspoon of any has around 68 kilojoules (16 Calories). They are all sources of sucrose OR glucose OR fructose OR combinations of these three but very little in the way of vitamins, minerals or antioxidants. Dietary guidelines around the globe suggest we LIMIT consumption of sugar and foods with added sugars. You don't need to avoid sugar completely for good health, but it's sensible to cut back on foods that are correspondingly low in nutrition and easy to overeat – soft drinks, lollies, pastries or sweets, for example. Foods such as flavored yogurts or flavored milk have a better nutrient profile and give you important nutrients (protein, calcium) along with the sugar they contain. With 68 kilojoules (16 Calories) in every level teaspoon, use only small amounts of sugar to enhance the flavor of nutritious foods - a spread of jam on grainy bread, a sprinkle of sugar over high-fiber cereal or a sugar syrup to poach fresh fruit. But watch the large intakes that come from soft drinks, juices, confectionery, chocolate, ice creams, and pastries.